Tuesday, May 14 at 1:00 pm. 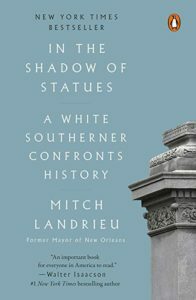 Join us at Killingworth Library as we discuss In the Shadow of Statues: A White Southerner Confronts History by Mitch Landrieu. “There is a difference between remembrance of history and reverence for it.” When Mitch Landrieu addressed the people of New Orleans in May 2017 about his decision to take down four Confederate monuments, including the statue of Robert E. Lee, he struck a nerve nationally, and his speech has now been heard or seen by millions across the country. In his first book, Mayor Landrieu discusses his personal journey on race as well as the path he took to making the decision to remove the monuments, tackles the broader history of slavery, race and institutional inequities that still bedevil America, and traces his personal relationship to this history.